I have never been one of “those” people…you know who I mean, the bird chasers. Don’t get me wrong, I enjoy birds, love to watch them, photograph them, and learn about them. But the idea of dropping everything and heading out to see a rare bird was not in my repertoire…until now. 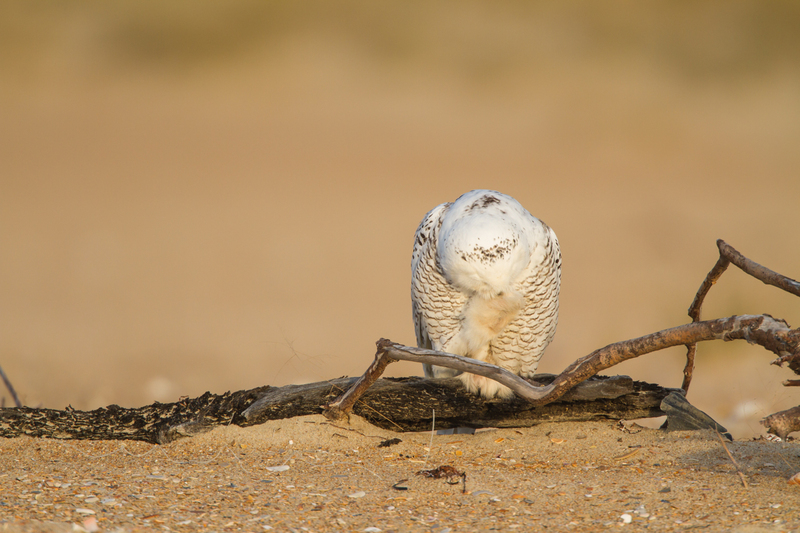 My young birder friend, Lucas Bobay, posted something on his blog last week about making a trip to the Outer Banks to see the newly arrived Snowy Owl. He and his friends were out there in what looked like miserable conditions of wind and rain, but they saw it. I could sense their excitement in his words. And, it is a bird I have always thought would be cool to see. So, I decided to head out Tuesday and see if I could find it. Turned out to be an adventure. I got a late start and was driving down through Cape Hatteras National Seashore a little after lunch when I reached the Bonner Bridge over Oregon Inlet. Some portable stoplights and lots of yellow trucks emblazoned with the DOT insignia indicated some road work was going on. I’ve always enjoyed going over that iconic bridge because of the elevated view of the ocean and marshes bordering the inlet. As I sat at the stoplight near the far side of the bridge, I heard an announcement on NPR – “The NC DOT has declared a state of emergency and closed the Bonner Bridge over Oregon Inlet for safety reasons, effective immediately”. Say what? But I’m on the bridge! It is one of those things you aren’t quite sure you hear correctly and then it is gone. I looked around and everybody seemed to be doing normal things – no Gull Little running around yelling “the bridge is falling, the bridge is falling”. I switched stations hoping to hear the announcement again…nope, just some music and news. The light turns green…do I turn around? ; did I hear what I thought I heard? I debated turning back at the far side of the bridge and trying to return to the mainland but decided, what the heck, I’m retired, and there’s a possibility of seeing a Snowy Owl. So, on I drove. After finding the beach access ramp number I had read about online, I walked out toward the ocean with high hopes. No owl….I scanned to my left toward the Point…nothing. Looking down the beach to my right I saw three people walking several hundred yards away. 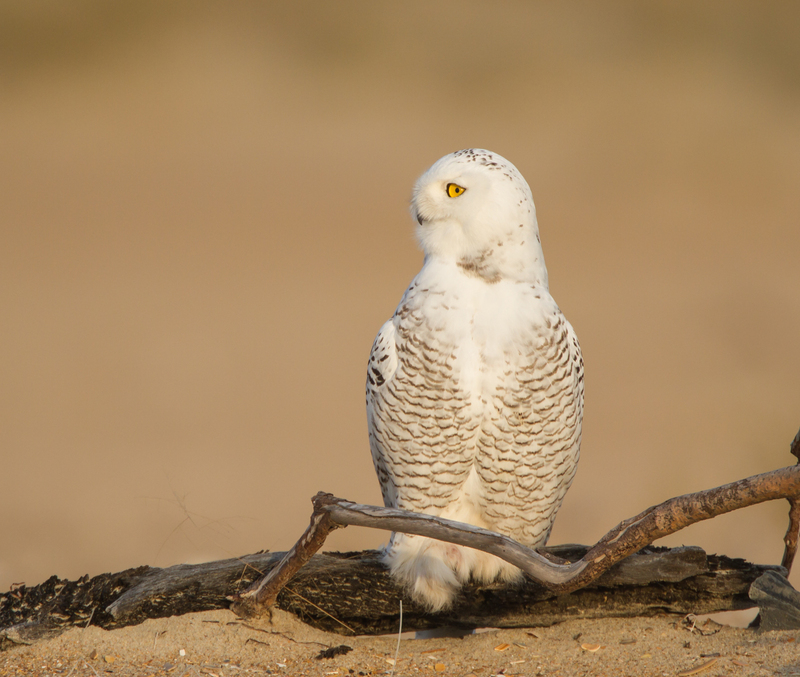 I looked with the scope and saw a small white blob on the beach – my first Snowy Owl! I gathered my gear and starting walking when I saw the owl take flight and head my way. I stopped and it landed a few hundred yards away between me and the walkers. They continued…I stayed put. The owl flushed again and flew right past me and landed on a log on the beach. 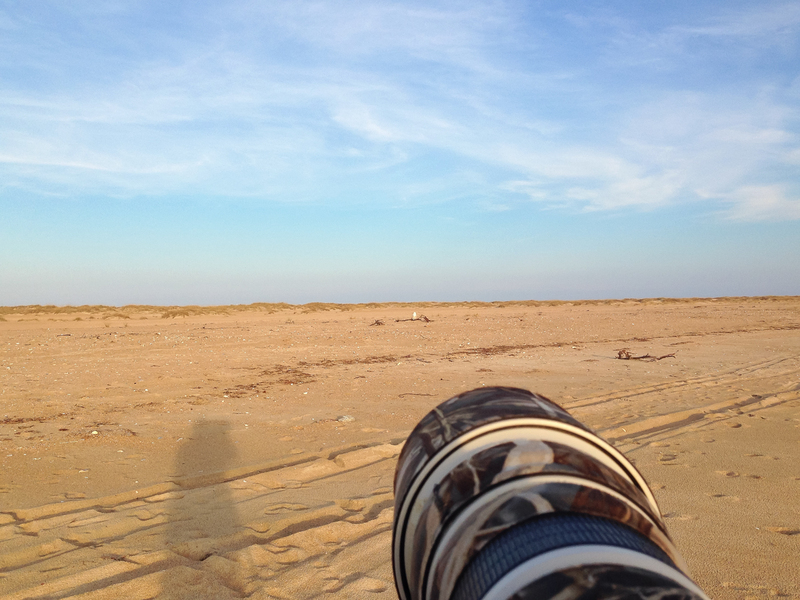 As I sat up the camera the walkers stopped higher up on the beach to view the owl through their binoculars. They then veered off to the parking area and I was alone with the bird. And what a magnificent bird! 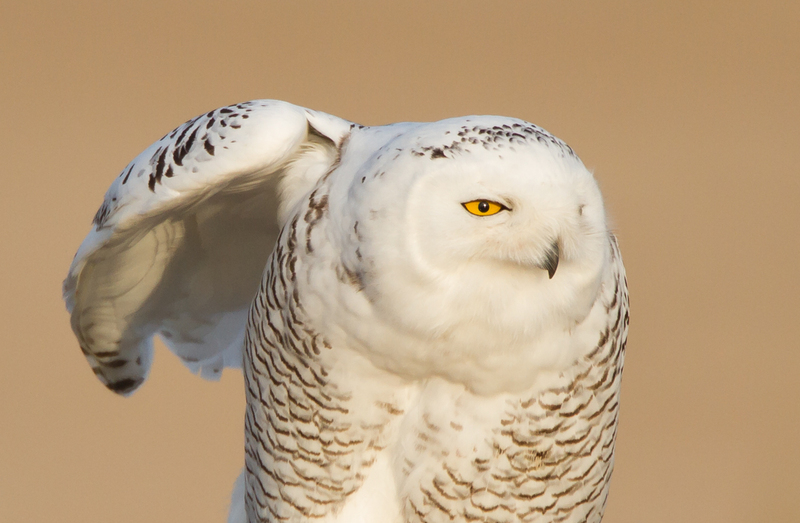 Snowy Owls are at home in the far north of the Arctic. In winter, most stay near their frozen homeland, with some migrating into southern Canada or occasionally the northern U.S. But once in a while, a Snowy Owl migrates farther south. The last time one was seen in North Carolina was 2001. And now, this one. The usual thought is that birds migrating this far out of their normal range are young ones that are seeking a winter food supply in years when their prey base in the Arctic (lemmings) is scarce. And this happens only once every few years. 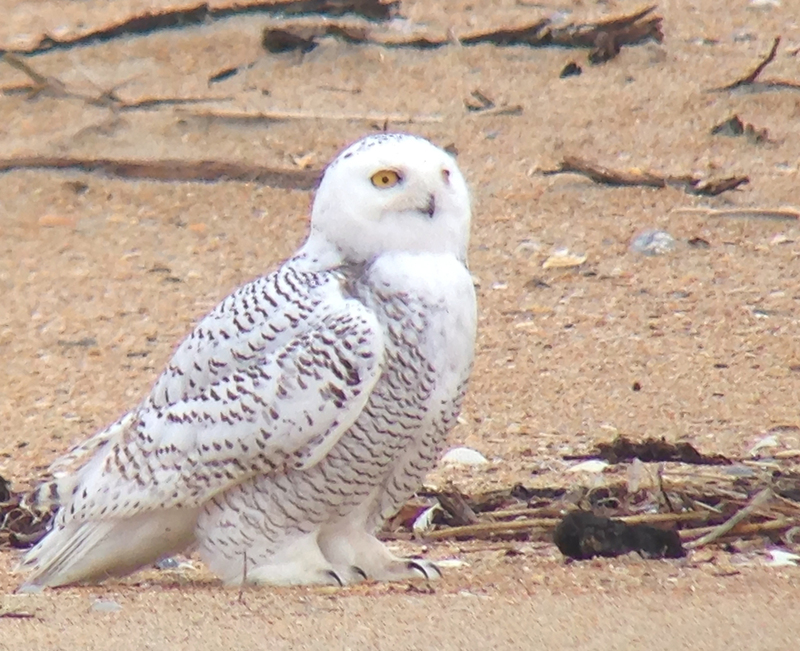 But this year seems to be different with Snowy Owls showing up all over the East Coast (and now at least three reported in NC). 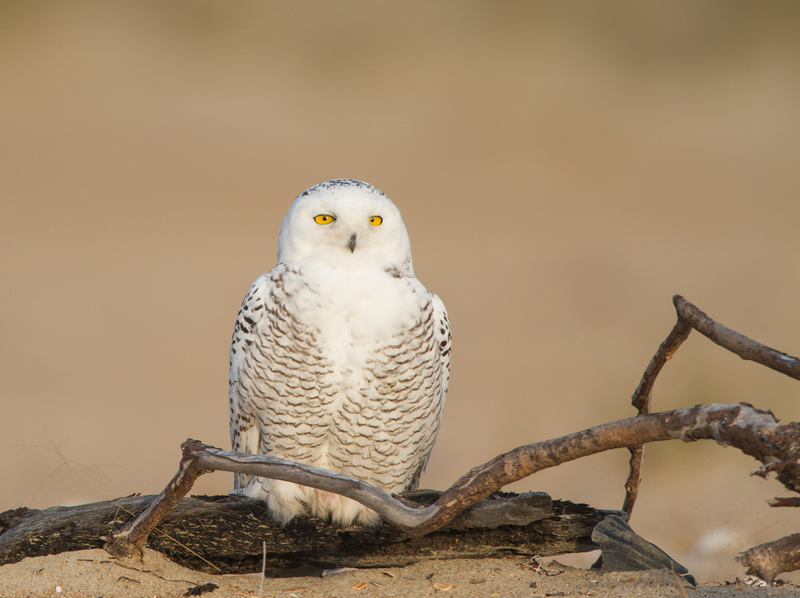 Kenn Kaufman has written on this year’s unusual migration in a nice article published this week in Audubon Magazine (http://mag.audubon.org/articles/birds/notes-snowy-owl-invasion). The owl landed about 50 yards from me. I took a few shots with the big lens and started to ease a little closer, taking a step, or at most, two, when it looked away. It was swinging its head around keeping an eye on every gull that called or flew anywhere near. Over a span of about 30 minutes I was able to creep a few yards closer. The owl finally looked straight at me and I decided that this was close enough. I did not want to spook it. Over the next hour or so, it began preening its gorgeous plumage, especially the feathers on its feet. It stretched a few times and turned its head frequently looking at all sorts of things seen and unseen to my meager human eyes. At one point, the owl straightened up, opening its eyes wide and staring at something for several seconds before settling back to a more restful pose. I could not see what had caught its attention, although I had seen a Peregrine Falcon when I first walked out, so maybe that had flown by again. I was glad the owl seemed to accept my presence. While I am sure it knew I was there (try as I might I could not make myself look like a seashell washed up on the beach), my lack of motion, plus the fact that there was just me, probably allowed it to go about its normal routine. I felt truly privileged to spend so much time alone with this bird in such a beautiful setting. Close to sunset, a young man walked out onto the beach with his dog. The owl acted a little nervous and then flew a short distance with the lighthouse now in the background. I waved the young man away and he walked up to talk after seeing the owl. He didn’t know about it or how rare it is to see a Snowy Owl in these parts, but he seemed to appreciate it and thanked me before walking off down the beach. When it was time to leave, I turned around and walked away from the bird towards the water. I wanted to walk way around the owl back toward my car so as to not disturb it. As if it had not been good enough just to be with the owl, a pod of dolphins swam by at that moment in the low angle light of the setting sun. A great day indeed. The next morning was overcast and drizzly and I found the owl about 3/4 of a mile in the other direction down the beach. When I walked down, there was another birder. We were soon joined by two more folks interested in seeing this rare bird. The owl made few short flights, including two where it seemed to be chasing some grackles that were foraging on the beach. But there was no breakfast for the owl while we watched. I didn’t even take my camera out that morning due to the weather but had brought a spotting scope. I used an adapter purchased specifically for this scope and my iPhone and took a few shots. I still have a lot to learn about “digiscoping” apparently as most of the images turned out pretty “soft”. But it was still fun to try. One person left and one of the remaining folks then walked out toward the owl and flushed it. I briefly discussed with her why it is important to try not to unduly disturb the bird: it is in unfamiliar territory; it may be a young, inexperienced animal; undue disturbance could cause it to use more of its energy reserves and disturb its hunting success, etc. She seemed to understand, but then walked back out towards it hoping to get a closer picture, and flushed it again. This is a common problem, one that I admit to being guilty of myself from time to time – trying to get just a little closer to an animal, and then spooking it. It helps to have a long lens, and it pays to closely observe the animal. My rule of thumb is that if I change the animal’s behavior, then I am too close. If that happens, I either back away or just stand still until the animal resumes whatever it was doing. This bird is such a rarity and is in a fairly accessible location (even with the bridge now closed) and word has spread rapidly about it via various list serves (and even through blogs like this). I worry a bit that the owl may be bothered to the point of it having some negative consequences. So, please try to respect this, and any other wildlife you encounter. It is best to view from a distance, using a scope, if possible, and as long a lens as possible for photography (borrow or rent one for special occasions like this). If you are lucky enough to go try to see the owl, don’t “rush and flush” it. Be patient, spend some quality time with it, observing it, and appreciating the beauty of this exquisite visitor from the far north. 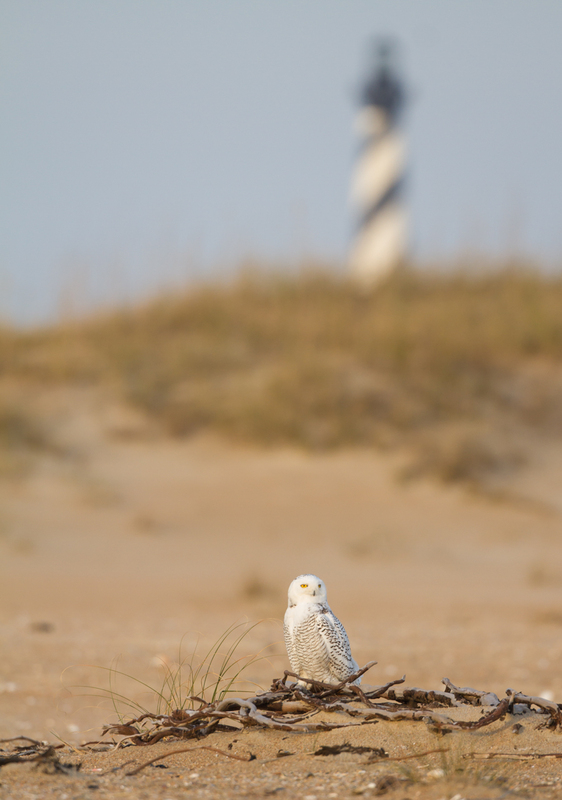 This entry was posted in Natural History, Nature Photography, Trip report and tagged cape hatteras, snowy owl, watching wildlife etiquette by roadsendnaturalist. Bookmark the permalink. Stunning bird and stunning pictures & video! 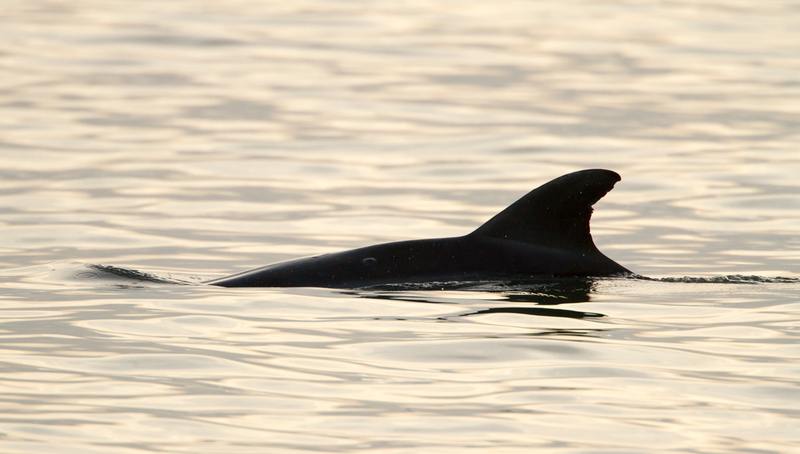 And then even dolphins as the icing on the cake….. Thanks for sharing your adventure Mike. Wow! Incredible. I’m glad retirement is treating you well Mike! I’ve always looked up to you as the type of Naturalist I hope to be someday! Your blog is an inspiration for sure. Hope we can catch up one of these days. If you are ever in my area, would love to go play in the woods a bit!! Take care. Sounds good to me. And trust me, Jesse, you are there as a naturalist. I admire what you do. 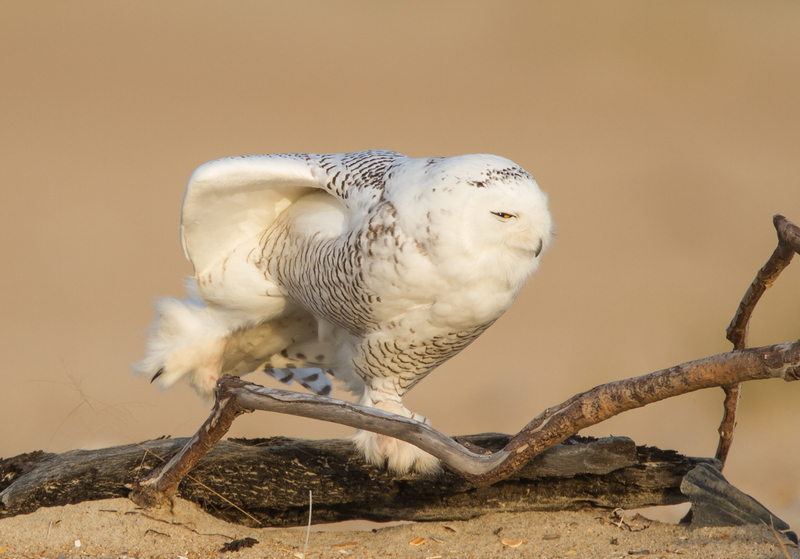 Snowy Owl photos….my favorite post thus far! Magnificent bird. I did not see an attached video to view? It sometimes takes a moment to load. Try again and let me know if you don’t see it. Great shots Mike! What a wonderful opportunity to observe such a rare and beautiful bird. Really loved that you were also able to capture some video. Thanks, Sam. Yes, I have a few other video clips. The owl’s behavior was just so fascinating to watch. Thanks, Lucas. I owe it all to you and the rest of the bird nerd crew:) It was so cool to be there alone with the owl for so long. Hi Mike, Petra told me about this a few nights ago and I have finally gotten a chance to check out your blog. Your “adventure” turned out to be quite fruitful. What an awesome experience to be so close to that bird. As an avid bird lover I am extremely jealous. Your video really made me feel almost there. Thank you for sharing this sighting and your outstanding knowledge and photography. Thanks, Dave. It was a magical afternoon with a beautiful bird.